When I was first diagnosed with fibromyalgia, my children were two and four. I was exhausted all the time, and most days, I could not make it through the day without a nap. That was all well and good if my preschoolers were also taking naps, but they were growing out of needing naps and were in a mischievous phase. One afternoon I woke up to find my two adorable children covered in black paint from head to toe. They had decided to paint the playset. My four-year-old had climbed up on the washing machine to get the tempura paints. (Thank God for washable paint!) On that day, God gave me the grace to laugh, but there have been many other days since then when I have wondered how I am going to make it with chronic illness. How will I keep up with a part-time job and responsibilities as a wife and mom? How will I keep from living in an overwhelmed and discouraged state every day? As we spend time in God’s Word, He refreshes us. He leads us to the right verses which are just what we need at the moment. 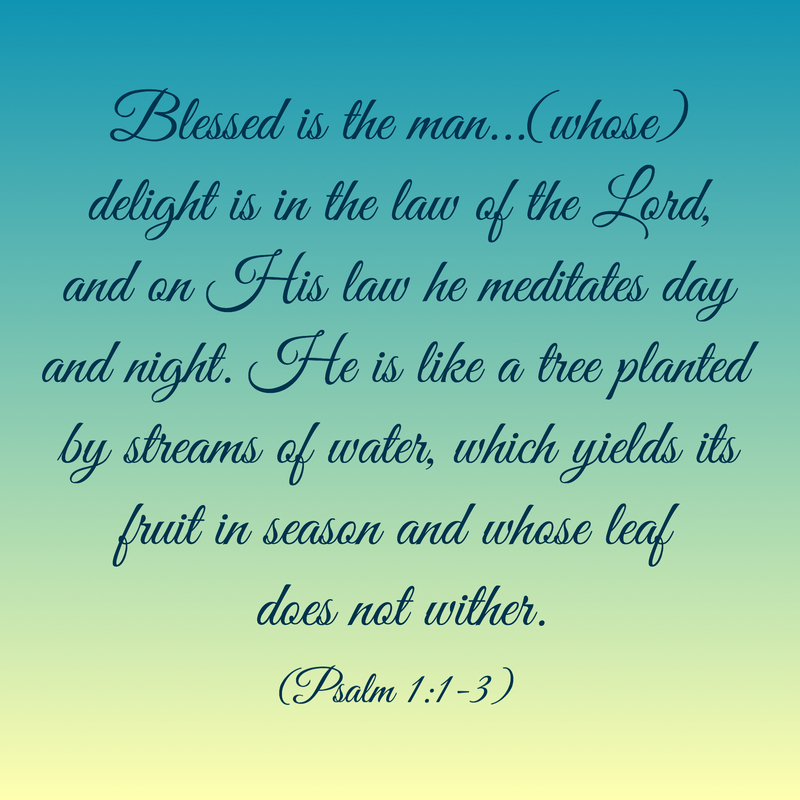 He says that when we meditate or think on His Word continuously, we will not wither and die, but we will actually be fruitful in the dry and difficult seasons. But this happens only if we come to Him. The challenge is making the choice to keep looking up. I will never forget the time I was flying on a plane in a horrific storm. The sky was black, and I was terrified of how we were going to make it in the turbulence. I was a little surprised we were even allowed to take off, but we were. Within minutes after take off, we were breaking through the clouds, and to my sheer amazement, above the thick layer of intense black clouds were thick white clouds that looked like a sea of cotton-balls. The sun was shining brightly above the clouds, despite the intensity of the darkness beneath the clouds. Make time each morning to read a short devotional or chapter in the Bible. Doing so will help you have a good perspective all day. Use an app like First 5 (from Proverbs 31) or use Bible gateway or Olive Tree Bible reading plans to help you be consistent. Write down the things that have special meaning to you when you read. When you are discouraged, you can look back over these things and be reminded and encouraged. Listen to inspirational Christian music all day long or as often as possible. As you do this, you will be encouraged throughout the day and better equipped emotionally and spiritually to handle whatever difficulties arise in your day. Surround yourself with positive people. Find a church where you can make friends with those who love God and will encourage you with Godly counsel when you need it. Decrease the amount of time you spend with people that are affecting you negatively. Write out Bible verses that are especially meaningful to you on notecards and place them where you will see them often. This will keep Scripture at the forefront of your mind all day long and will give you spiritual strength to endure despite pain and illness. Join Christian social media sites that will send you encouraging messages throughout your day via email or when you check your Facebook or Twitter accounts. Girlfriends in God and Proverbs 31 are two sites for women that will send daily devotionals and words of encouragement. Crosswalk.com also sends daily devotionals and provides many online resources for Bible study and general enrichment. God-Living with Chronic Illness has a Facebook site to encourage those with pain and illness and also has a site just for moms with chronic pain or illness called God-Living Girls. Keep inspirational books so you can read a few pages when you have free minutes during the day, for example, when you have lunch or go to the bathroom. I like to keep books in various places like the kitchen, bathroom, car, and at work so that when I need encouragement, I can read a few inspirational words and “reset” my thoughts during a discouraging or stressful day. Make sure you get plenty of rest at night to prevent discouragement that can come from being overly tired. Read Psalms before you go to bed. This book of the Bible is full of praise to God and encouragement for when you have had a bad day. Keep a gratitude journal in which you write 3 things you are grateful for at the end of each day. This will help you end the day with gratitude even if the rest of the day was unbelievably hard or discouraging. Keep a prayer request journal so you can see how God has worked in your life and answered your prayers. Looking back over your journal will remind you of God’s faithfulness in the past and help you remember that He will be faithful in the future as well. Life with chronic pain and illness is definitely not easy. Discouragement can become our constant companion. But when life is hard and feels desolate, we can keep our eyes on God and watch as He turns the bad into good and gives us a life full of beauty and even joy in spite of the difficulty. This entry was posted in Dealing With Emotions and tagged acceptance, Chronic illness, chronic pain, Discouragement, exhaustion, Surviving. Bookmark the permalink. Thank you so much. I am glad it was an encouragement. Your posts always do the same for me! I love everything on this list. And Christian music and radio is so helpful. Glad you were able to laugh through the black paint adventure. You have a beautiful, encouraging site. Thanks, Lisa! I love your posts as well. I am looking forward to meeting you at the #livefree retreat! I’m so glad I came across some of your pins. I did not know while re-pinning them you too also suffer from fibromyalgia. This is definitely God leading me to you. I’ve only been diagnosed for 9 months, and I’m 38. It clarifies much of the pain and challenges I physically faced, since I was a teen. I am a wife, a mother of 4, and a middle school teacher. My body nor my brain ever has time to rest. Your site will help fill in the blanks for me. Thank you.